The official Melbourne Cup 2014 field of 24 stayers facing off in Flemington Race 7 next Tuesday has been released by Racing Victoria with Admire Rakti leading the final acceptors. Caulfield Cup winner Admire Rakti is the headline 2014 Melbourne Cup final acceptor for Tuesday’s famous two mile classic. Photo: Race Horse Photos Australia. Winner of the Group 1 Caulfield Cup (2400m) in his Australian debut on October 18, the Tomoyuki Umeda-trained Heart’s Cry stallion will now shoot for the coveted Spring Cups double. He’s the headline acceptor for the $6.2 million Group Emirates Melbourne Cup (3200m) and has been dominating futures Melbourne Cup betting at Ladbrokes.com.au before today’s final field announcement. Penalised half-a-kilo by Racing Victoria chief handicapper Greg Carpenter for the Caulfield Cup victory, the seven-year-old now has a modern day weight carrying record to break with 58.5kg for the ‘race that stops a nation’ with Hong Kong-based Aussie hoop Zac Purton in the saddle. The last horse to complete the Caulfield Cup – Melbourne Cup double was Ethereal (2001) while Japan quinelled the world’s richest handicap back in 2006 with stable mates Delta Blues and Pop Rock running one-two. The Melbourne Cup field this year features a total of 11 international hopefuls with the next best in betting after Admire Rakti being the Andreas Wohler-trained Protectionist (56.5kg). A son of Monsun, Group 2 Prix Kergorlay (3000m) winner Protectionist travelled down under and debuted in Oz on October 11 when a fast-finishing fourth in the Group 2 Herbert Power Stakes (2400m). The step up in distance is set to suit the five-year-old then who also drops back from 59kg. Following Admire Rakit in the Melbourne Cup weights are three 57kg hopefuls, a weight no Melbourne Cup winner has carried to victory in over 30 years. The Robert Hickmott-trained Fawkner, Ed Dunlop’s dual Melbourne Cup runner-up Red Cadeaux and Saeed Bin Suroor’s veteran nine-year-old Cavalryman are those looking to be the first to win with 57kg this year. Fawkner is the best fancied of two in the race for four-time Melbourne Cup winning owner Lloyd Williams who lost his 2012 champ Green Moon to a cracked hoof on Saturday morning. Winner of the Caulfield Cup last spring and this year’s Caulfield Stakes before a brave second to Adelaide in the Group 1 Cox Plate (2040m) last Saturday, Reset seven-year-old Fawkner is one of the best in betting for the classic. If successful he will be the first seven-year-old Melbourne Cup winner since Makybe Diva for her third back in 2005. Williams and trainer Robert Hickmott will also saddle up outside chance Sea Moon who was a distant 13th in the Melbourne Cup last year and unlikely to challenge again this season after finishing dead last (18th) to Admire Rakti in the Caulfield Cup last time out. Red Cadeaux meanwhile contests his fourth straight Melbourne Cup this spring after running second to Duanden in 2011 in the closes Melbourne Cup finish in history and then second again two years later behind the Gai Waterhouse-trained Fiorente 12 months ago. In last year’s Melbourne Cup the gelding came off a fourth in the Irish St Leger, jumped from barrier 23 of 24 and carried 56.5kg. He only has half a kilo more this year, will be hoping for a better barrier in the draw later this evening but hasn’t been in great form with his latest effort being a distant last in the Group 3 September Stakes (2414m) eight weeks ago. 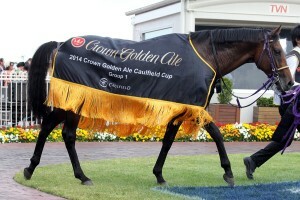 Cavalryman meanwhile also returns down under for Godolphin having run 12th in the 2012 Melbourne Cup behind Green Moon. His lead-up run this year was a fourth to Pale Mimosa in the Group 2 Lonsdale Cup (3299m) at York, before which he won over the two miles in the Group 2 Goodwood Cup (3218m) on July 31 making him a credible shot at his pet distance. Bin Suroor is after his maiden Melbourne Cup winner after a number of close calls and will also saddle-up Willing Foe (55kg) who comes off a second in the Group 3 Geoffrey Freer Stakes (2700m) and an Irish St Leger fourth to Brown Panther from mid-September. Both Red Cadeaux and Cavalryman are out to become the first nine-year-old to win the Melbourne Cup since it’s inauguration in 1861. The oldest Melbourne Cup winner in history has been an eight-year-old. Other notable Melbourne Cup final acceptors that made the cut include Kris Lees’ beaten Caulfield Cup favourite Lucia Valentina, today’s Lexus Stakes winner Signoff, Michael Moroney-trained Araldo who made the cut and comes off a Caulfield Cup fifth and Unchain My Heart who was scratched from today’s Lexus Stakes. See below for the full 2014 Melbourne Cup field with the barrier draw to follow live from 7pm (AEDT) from Flemington Racecourse. Updated Melbourne Cup odds are due out shortly at Ladbrokes.com.au too so make sure you have account with the country’s premier bookmaker to get in on the action!